Quote: Most web browsers nowadays support extensions that add, change, or remove certain functionality from the browser itself or websites. Extensions may be installed to block advertisement or tracking, add functionality to websites, keep track of item prices, change the New Tab Page of the browser, or correct your spelling. It should not come as a surprise that extensions that do get loaded consume some resources. 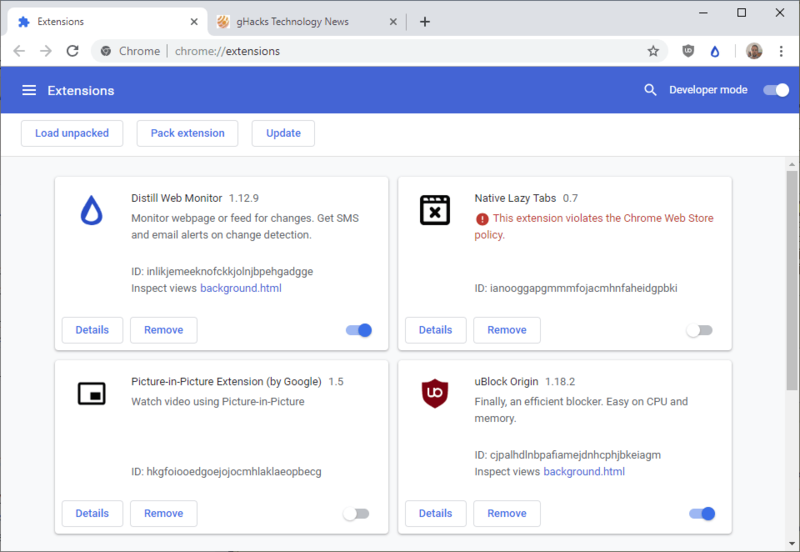 26 different Chrome extensions were analyzed recently to find out if they impact the browsing performance. Popular extensions such as uBlock (Origin I suppose), Adblock Plus, HTTPS Everywhere, Grammarly, LastPass, or Google Dictionary were selected for the test. The average extension does not impact performance significantly. The more extensions you use, the higher the performance impact. Privacy tools improve performance on pages with lots of advertisement or tracking scripts even though they have a small initial cost. Some extensions, especially those with page-related actions, impact performance more. What are those page related actions that impact more?